Palettes on my wishlist this Summer, with bolds and neutrals. When I travel, I usually know what palettes to pack. Something like theBalm's Balmsai or Sleek Vintage Romance will see me through a week. If my trip is shorter or only includes day-events or formal occasions, I go in for Too Faced Chocolate Bar or an IT Cosmetics matte palette. But not this time. The problem: I was packing for my six-week trip to the UK/Europe when I realised that none of my palettes would suit - unless I wanted to cartload three or four palettes, or pack a whole Sephora Blockbuster and chuck out a dozen clothes, the mac and wellies (hello again, London). I have formal day-events, evenings out, theatre trips, meetings with friends and even a circus planned, so I need variety. What I want: about four or five colourful shades which include a couple of jewel tones (purple and blue, definitely) and a couple of brights, and six or so neutrals, from beiges and browns to coppers, greys, plums and a smoky black. A nice mix of mattes and shimmers. And, the whole thing must not take up much room. I don't ask for much, do I? The immediate solution: Pack a basic trio or quad and go shopping on arrival. I have made a list of options. 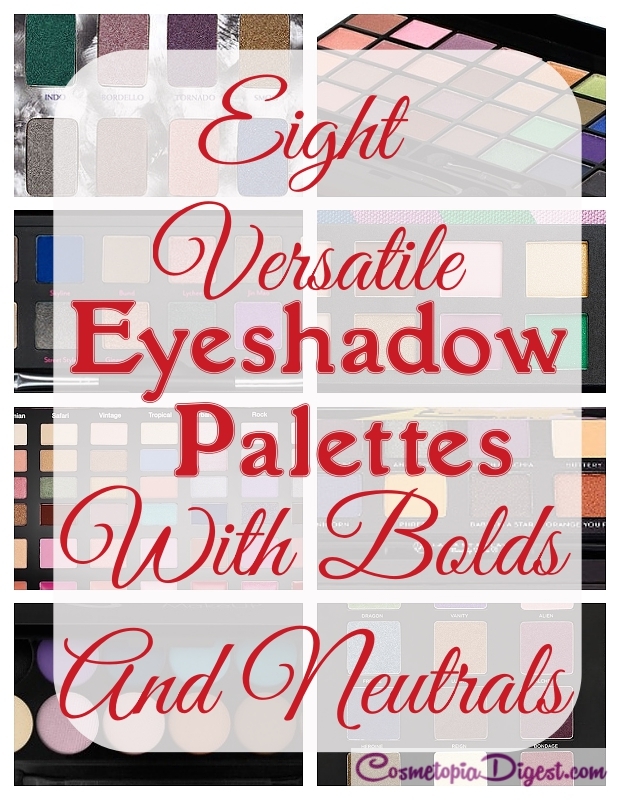 Here are eight versatile, travel-friendly eyeshadow palettes with a versatile mix of bold and neutral colours on my wishlist this Summer. Urban Decay Shadow Box is supposed to be a disappointment formula-wise, but the shades in this palette are a mix of five colourful shadows and eight neutrals, which is a great combination while travelling. As for the formula, I'm not sure how bothered I would be about dryness and fallout while travelling, as long as the colours don't crease. The point is to have a variety of options while flitting from a board meeting to a restaurant to the theatre, see? Formula apart, if I skip this palette, it would be because only one of these shades is matte. Boo! Cost-wise, this will set you back by $34. Cargo Shanghai Nights is a must-have for me. There are four colourful shadows and eight regulars. Three of these are matte. You cannot go wrong with Cargo's formula, which is super-pigmented and wears nicely. I have the Let's Meet in Paris palette from Cargo and in my review (see here), I had mentioned that Shanghai Nights was the next on my list. You bet! Sephora Collection IT Palette Color Spectrum has 12 eyeshadows - and it is on sale for $19 now! The packaging is colourful and the shadows are as pigmented as you can expect from Sephora's own-brand eyeshadows. Six of the shades are nice and colourful while the rest are basic neutrals. Two are bases; two can be used as liners. Half are mattes while the rest are shimmery. Plus, you get an eye pencil to boot! Gimme it, please. The ELF Studio Makeup Clutch looks huge, but folds up to a handbag-friendly 6.5'' x 4''. Apart from the whopping 32 eyeshadows, there are six lip glosses, two blushes and a bronzer, an eyebrow powder and a cream and a highlighter. It is on sale for $10 on the ELF website, though the original cost is $30. At that price - and at that size - you cannot go wrong. Urban Decay Vice 3 got bad rep for formula. It has 20 eyeshadows, of which 12 are shimmers/pearls while 8 are either matte or have microglitter that doesn't show up anyway. The colours are nicely divided among neutrals and brights and most swatches I have seen online look good. The packaging is so pretty that I will definitely swatch it in person and decide whether I can pull off the shades with primer. If I had to choose between Box of Shadows and Vice 3, I would pick Vice 3 for the number of shadows, and all these are new shades. Erika of Notes From My Dressing Table liked the palette (see her detailed review here), and I usually like the eyeshadows she likes, so it should be a good buy. Cost: $60 - not the cheapest out there. Anastasia Beverly Hills Artist Palette is a beauty! Five shimmers; seven mattes/velvets. Six of these are colourful while the others are subtler. There is a dusty rose eyeshadow in this palette, and you get a double-ended shadow brush. Just $30 on Sephora. I want. No, I need. If I had to choose between the ELF palette and Sephora Iconic Looks Palette, I would definitely pick the latter, despite the difference in cost. There are 28 eyeshadows, 7 blushes and 7 glosses - you do get more in the ELF Clutch - but the shadows here are arranged according to the "look" you want. So you have Bohemian, Safari (I need that khaki green), Vintage, Tropical, Urban chic, Rock and Glamour. Or you can stuff their combinations and mix and match. Only 12 shades are among the colourful but the combinations they have chosen are perfect for adding a pop of colour if you are sick of the neutral routine. Size? This folds up into a neat thin clutch you can place between two T-shirts. Plus, you don't need to pack blush or gloss. If you have a trip that will be longer than a fortnight and you wear makeup everyday, this will suit you. Sleek iDivine Original Palette was the very first iDivine palette from Sleek, and one they have continued to make. Seven colourful shadows and five subtler shades ought to be enough for a trip and the colour combination is perfect, with a mandatory purple, teals and green, BUT there is only one matte, and that is the basic black shadow. Big Fat Boo! If you take along an IT Cosmetics matte palette as well, then this will see you through while travelling. Cost: At $11.99 for 12 shadows, who cares about the lack of mattes? So which will I buy? It depends on 1. what I find first 2. how they swatch on my skin and 3. other things I buy. If I buy a bunch of collectibles, then that reduces the amount of makeup I can stuff into my suitcase. If I see Vice 3, ABH and Cargo first in Covent Garden, I may not buy the Sephora palettes in Rome. What palettes do you pack for a two-week/longer trip? Do you go with neutrals alone or do you like the odd bit of colour to kill the monotony? Tell me in the Disqus comments widget below.